Jennifer joined Pain Recovery Solutions in May of 2016 after graduating from Eastern Michigan University with her Master’s degree in Science. Jennifer is a nationally certified and state-licensed physician assistant. 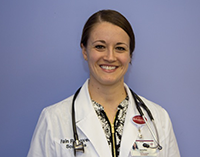 She specializes in pain management, addiction medicine, and primary care. Before joining Pain Recovery Solutions, Jennifer worked as a certified athletic trainer. She has experience with the management and rehabilitation of acute and chronic orthopedic conditions. She has had the opportunity of working with patients of varying ages and backgrounds. Jennifer holds an additional Masters Degree in sports management and a Bachelor’s degree in Athletic Training. She resides in Ypsilanti, Michigan and enjoys spending time with her family, cooking, and playing soccer.